Better known as a famous landmark of <?xml:namespace prefix = st1 />Tokyo, Tokyo Hotel sets new standards in hotel culture. Offering excellent entertainment, lodging, and dining, the Tokyo Hotel creates the perfect dream holiday for its visitors. Located in the heart of Roppongi, Tokyo's largest business and commerce area and close to Narita and Haneda International Airports, the Tokyo Hotel is ideal for business travellers as well. Tokyo Hotel's excellent accommodation facilities include the use of natural wood and fabrics creating an authentic atmosphere. Contemporary amenities such as a 13-inch flat-screen television in the bathroom, voicemail and CD / DVD player are included in the guest rooms and suites of this luxurious Hyatt hotel. The highlight of the Tokyo Hotel accommodation is the Presidential Suite on the 21st floor, the only suite in Tokyo with a private outdoor heated swimming pool. Tokyo Hotel surpasses all expectations on choice of restaurants and bars within the hotel. The hotel features eight restaurants offering different cuisine such as French, Italian, Chinese and traditional and modern Japanese dishes. Juniper Cafe and Bar also offers fun and excitement for everyone. Tokyo Hotel features 13 meeting rooms including four ballrooms and two boardrooms and 2800 square metres of conference and meeting space. State-of-the-art equipment and a team of professionals are provided by Tokyo Hotel to ensure a successful event. Tokyo Hotel is close to most of Tokyo's attractions such as Roppongi Hills, Imperial Palace, Tokyo Tower, Shinjuku Gyoen Park, Asakusa Kannon Temple and Meiji Jingu. The luxurious accommodations of the Tokyo feature a host of lavish room amenities. The Tokyo Hotel offers a variety of dining options in the hotel premises. Juniper Café and Bar - garden fresh salads, tasty sandwiches, homemade soups and an array of desserts. TVs mounted outside, enabling the public to view the excitement and energy of this lively café. The Oak Door- quality meats and ingredients cooked to perfection in dramatic wood-burning ovens, located in an open kitchen. 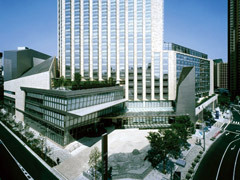 The Tokyo provides many services and facilities for the convenience of hotel guests. A special feature of the hotel is the Presidential Suite on the 21st floor, the only suite in the city with a private outdoor heated swimming pool.